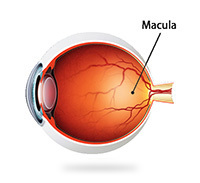 Macula is organization of retina rerated to eyesight. There are a lot of cells to recognize letter and color. Disease of macula is cause a low vision and central scotoma. We recommend you to earlier examination. Disease of macula rerated to your eyesight and effect to your life. We can help examine about age-rerated macular degeneration and central serous chorioretinopathy. We use optical coherence tomography (OCT) to measure retina. You can reserve any time.